Need service at your dock or marina, we come to you! Stuck on the water? We come to you! We perform annual maintenance on all brands of outboard engines. We begin: as with each engine service we offer; with a comprehensive evaluation of the rudimentary components and functions of the engine. We then proceed with your annual maintenance schedule as specified by the manufacturer. We always use EOM, (Original Equipment Manufacturer) components. 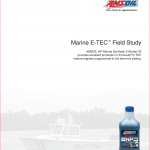 We use Amsoil lubricants which in all cases will exceed the API (American Petroleum Institute) ratings for the lubricants which bear the name of the outboard brands, although they do not manufacture them. We perform scheduled maintenance by appointment, which will get you in and out of the shop in a few days verses several weeks. 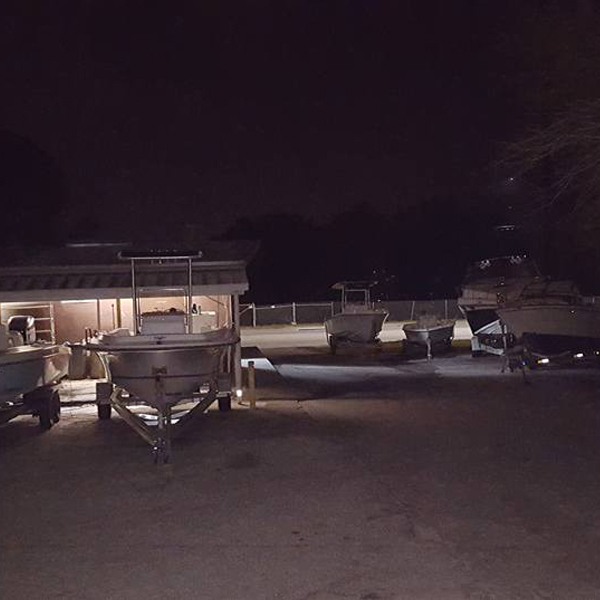 We will also perform scheduled maintenance by appointment at your residence with our “Shop on the water,” a pontoon boat equipped specifically for such tasks for those who keep their vessel moored or on a lift. 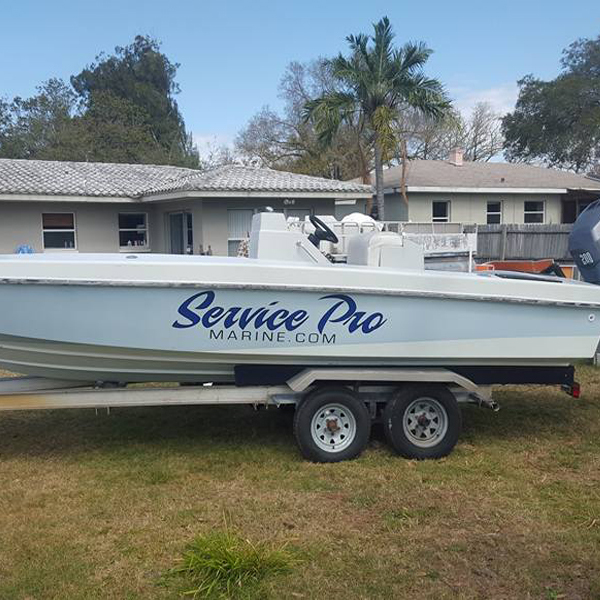 You can rest assured that Service Pro Marine will always live up to our name when you make that educated decision to choose us for your provider. At Service Pro Marine we are extremely versed on everything electrical. We perform the smallest of tasks, such as diagnostics on a bilge pump, to completely rewiring the entire vessel. We are not simply ABYC ( American Boat and Yacht Counsel ) compliant, but we go above and beyond their specifications to provide the absolute best in product and procedure. We use 14 gauge tinned marine copper conductors at minimum. This ensures years of reliable operation due to the diameter and electrical load carrying attributes. As marine conductors traverse their life span, they are subjected to the elements in the harshest degree. Salt water creeps into the insulation casing and begins to dissolve the conductors. When a conductor of smaller in diameter is used, it loses it’s conductivity faster, thus requiring replacement sooner. At Service Pro Marine we do everything possible to eliminate these issues. We prolong the life of your electrically operated components by using higher quality materials. In the bilge, and all other areas with a high rate of exposure, we use our standard connectors with a “heat shrinking” insulator, and we also double seal with another heat shrinking insulator on the outside of the connections. This “Double Layer” of insulation, prolongs the life of our already heavy duty conductors. We can also perform a face lift to your dash panel. Replacing the aging material of the switchboards to either a white starboard material or a smoked acrylic. These materials will withstand the elements far beyond those of metallic construction and produce a beautiful new look to your console. Most boat manufacturer’s specifications pale in comparison to our technique. If you love your boat, if you want your precious time and money to provide the longest and most dependable performance, you know who to call. We stand behind all of our installations. Service Pro Marine sets the standard for the highest quality electrical work in the industry, bar none. Give us a call for an estimate, let’s bring your boat up to “Pro” standards! 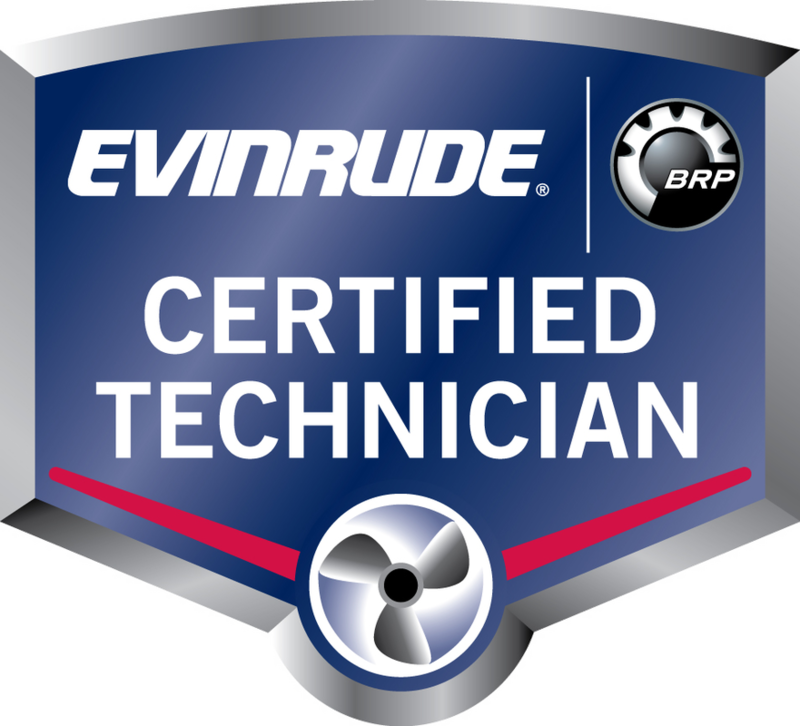 Here at Service Pro Marine we employ the timeless technique of “Symptom, System, Component” with years of experience as lead diagnostics tech, warranty claims administrator for Evinrude, Nick really knows his way around an engine. As well as implementing the common sense approach to troubleshooting we also employ the latest and greatest of engine diagnostics software, as well as DYNO testing to dial that engine in for optimum performance. Trust in Service Pro and see why, when so many others just try. Don’t let someone keep changing parts on your engine until they find the right one, costing you time and money. Get proven results fast! New Console / Switch Panel Mfg. At Service Pro Marine, under the strict supervision of Master Engine Builder Nick Hudson, we take older motors and breath new life, and looks into them. Whether it’s the engine you have owned for years, or an engine that you specify for us to build for you. Every engine we take on gets the utmost in care and scrutiny, every seal, every gasket, changed. Every internal part is subjected to various tests and inspections to make sure that they within factory specification without a hint of doubt. We go through the gearcase and the power trim and tilt unit with the same keen eye. We then remove the factory coating, prime and repaint with a catalyzed urethane that has a 40psi impact rating, and new decals. These engines come out looking better than new and will provide you with trouble free operation for years to come. We ship engines all over the U.S., our reputation is pure gold in the industry. See why Service Pro is one of the area’s largest engine restoration establishment. As with all of the services we offer at Service Pro Marine our fiberglass and detailing work is second to none. We use only the highest quality materials to achieve the highest quality results. Shawn Graf, our fiberglass and detail expert went to commercial art school, worked as an airbrush artist for a decade, then went into custom auto body, boat and motorcycle work. His talents are many and the results are always spectacular. He can do everything from bringing an aged boat back to showroom quality, to free hand airbrushing detailed graphics onto a custom engine cowling. Shawn ran “The house of Airbrush” in Panama city for 10 years, when airbrushing was very trendy, he refined his talents over those years completely mastering the art. His attention to detail is uncanny. On a chemical scale he knows the ins and outs of everything paint and glass down to an absolute science. Working with him is always a pleasure as we witness with every unveiling. Give us a call for a quote; from detailing, to custom striping and graphics, to airbrush customization. You will be amazed! At Service Pro Marine our electrical and ignition diagnostics skills are second to none. With all of the latest and greatest meters, adapters and test equipment in use, it’s a breeze. Don’t let something, or someone else get you frustrated, just bring it to the proven Professionals and let us rectify the issue. Whether it’s battery systems, pump systems, shore power, switch gear, generators or any other component that utilizes free flowing electrons, we’ve got you covered!! Nick and the boys at Service Pro did a jam-up job put a new foot on my Evinrude and had me on my way back home the same day for a good price too. Highly recommended, support your local business. Nick Hudson at Service Pro Marine is my go to guy for mechanical service of any type. 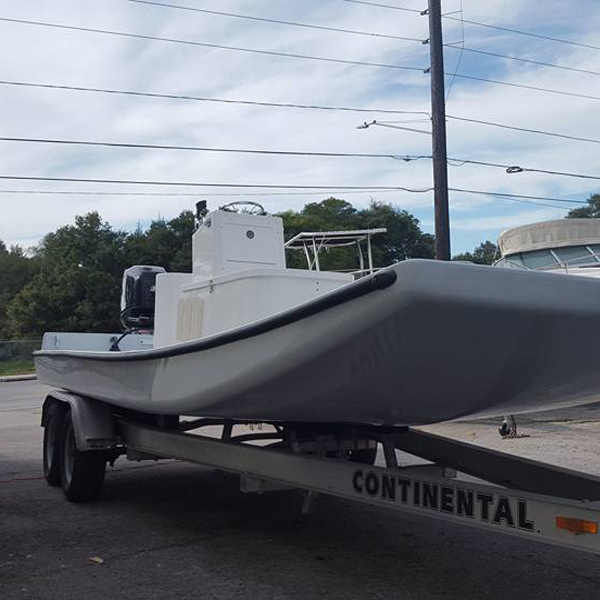 I own a local business doing marine lighting and electronics installation, and custom fabrication, however, I also run a forum dedicated to fishing and boating, so it's pretty easy to determine if a guy is legit or not, not only by seeing his work first hand, but through his reputation in the local community. Service Pro is second to none, with reasonable rates, fast turn around, and certified mechanics with years of experience. The right tools and knowledge to get it done right. Give them a call, you won't regret it. Ryan at There She Glows Lighting. Owner operated businesses are a hard to come by, and when you combine that with a passion for the water you get a level of service higher than any measurable standard. The best in the business as far as im concerned... I live in orlando and drive my marine equipment to him because i know it will be done correctly and will get it back in a very reasonable amount of time! Excellent customer service and explains everything to me easy enough for me to understand! Definitely suggest everyone with any boating issues to see Service Marine Pro before anyone else! Great people! Great business. Nick really knows his stuff. Very professional, and proficient with everything marine! He stands by his work, and is always ready to answer questions. Wouldn't take my business any were else in the Clearwater area. Don't waste your time and money anywhere else! I drive from frostproof to do business with Nick! Nick Hudson is the best around... From customer service to completed work and rates that can not be beat. 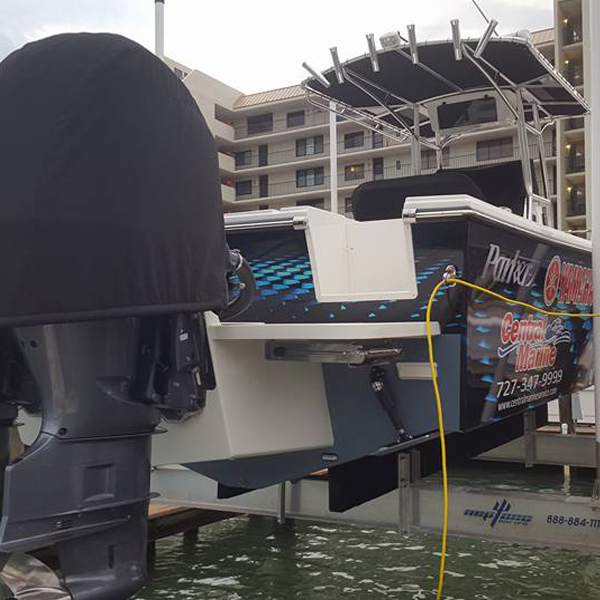 If you need someone you can trust or if you've had bad experiences with other marine mechanics let Nick and his crew at service pro change your mind and get you back on the water. Service Pro Marine shared a video. One more final Ghost Trap Rodeo is here!